I will not be Pinkwashed. Cancer is also preventable and treatable – something the pink pushers would like to ignore. I agree with the author of this article. This exploitation of breast cancer as a cause has become a huge money maker. It seems everyone wants in on the ruse. Perusing Facebook today and encountered another article, this one posted by Primal Docs. I do not purchase items simply because they support the pink ribbon. I make my purchase decisions based upon whether the product is of quality and promotes healthy lifestyle – as defined by Paleo/Primal criteria! I worked for marketing/advertising agencies for 5+ years and learned many tricks of the trade and I believe that helps me avoid some of them now. Two of the biggest tactics used are the emotional response to the tragedy of cancer and the desire to do anything to help; and the affiliation herding (or groupthink) – that feeling of belonging through purchase. I encourage everyone to think carefully about the “awareness” and charitable campaigns they support. Research the organization’s efforts and spending. What do they really accomplish and support? Health and longevity or profits? I for one will NOT be Pinkwashed! As a side note: one of the key chemical contributors to breast cancer are parabens. Parabens are a group of cosmetic preservatives that mimic estrogen. Studies in the UK have found at least 6 varieties of parabens in all breast cancer tumors tested. Look for the “-paraben” on the ingredient label of cosmetics and personal care products and avoid them like the plague! I choose Red Apple Lipstick lipstick and eye makeup because it is paraben-free in addition to being gluten-free. They are on a mission to share safe makeup with the world. And I recently found Tarte Amazonian Clay mineral foundation and mascara. They are also gluten- and paraben-free. There are safe, conscientious companies out there. We just have to make the time and effort to find and support them! This entry was posted in Beauty, Health and tagged cancer, gluten-free, parabens, pink, Red Apple Lipstick, Tarte on October 9, 2013 by Pamela. The latest from Red Apple Lipstick! The new Fall color collection is now available, and it is gorgeous. Perfect Fall shades for eyes and lips. Something for everyone! Cozy colors! Matte eye shadows in rich Fall shades and auburn red lipsticks. As mineral-based lip and eye products, the color is buildable from a soft hue to intense opaque color. Eye shadows also take on a new effect when applied wet. These mineral-based products also do not stain skin and clothing the way dye-based cosmetics can! Be sure to sign up for the VIP Club email list to get 20% off codes each month – the first one arrives IMMEDIATELY (conveniently located at the top of their web page). Free shipping for purchases over $50. Look for the many select-your-own discount packages in each category. This entry was posted in Beauty, Health, Uncategorized and tagged eyes, gluten-free, lips, makeup, Red Apple Lipstick on October 9, 2013 by Pamela. Since I’ve already tried nearly every pink- or red-based lipstick they’ve made to date, I suggested doing a review on their latest product line: Instant Color Lipstick. This formula is the creamiest lipstick I’ve ever worn, providing an ultra-moisturizing smooth feel. The color is opaque – INSTANT – just as you would expect from the name. It is pure, creamy color without shimmer or glitter. Most mineral-based lipsticks have a “buildability” feature, meaning you can apply sheer or build the color and opacity with multiple swipes. This formula is different from the others that way – it is more like traditional lipsticks in color intensity. It also wears down to a “staining” on the lips, keeping the color longer. The flip side, of course, is that you have to be careful where you put it – as it stays put. Lovebird, Oh My Guava and HibisKiss. These lovely lipsticks are unscented, gluten-free, nut-free, paraben-free, cruelty-free, vegan and all-around AWESOME! Be sure to sign up for the VIP Club email list to get 20% off codes each month – the first one arrives IMMEDIATELY (conveniently located at the upper right side of their web page). Free shipping for purchases over $25. Look for the many select-your-own discount packages in each category. What are YOU waiting for?! It’s Beauty without the Beasties! This entry was posted in Beauty, Review and tagged beauty, gluten-free, Red Apple Lipstick, review on July 14, 2013 by Pamela. Voted BEST at GFREEK- I second that!! I have shared my love and obsession with Red Apple Lipstick with you all several times. It appears I am not alone! 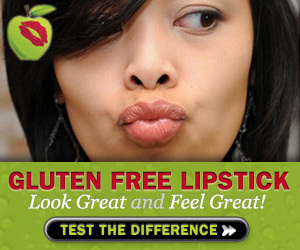 Red Apple Lipstick was voted the Best Gluten-Free Cosmetics Brand during this year’s GFREEK awards! Results published in Delight Gluten Free and Women’s Health magazines (see photos). I just can’t rave enough about all of the Red Apple products. Not only are they gluten, paraben and allergen-free, they are of genuinely superior quality. I have used some very high-end expensive brands, and these lip and eye products beat them all for color, overall appearance and wear. I truly love that my lips never feel dried out like they did with most other lipsticks, balms and glosses. And they smell fantastic! I love these lipsticks, glosses, balms and eyeshadows so much I became an affiliate and refer all my friends and family. I never go anywhere without my Red Apple Lipstick! So what are you waiting for?! Go get yourself some GFREEK Award-Winning, gluten/paraben/allergen-free, BEAUTIFUL makeup from Red Apple Lipstick! This entry was posted in Beauty, Celiac and tagged beauty, gluten-free, lips, makeup, Red Apple Lipstick on June 7, 2013 by Pamela. Lakewinds Co-op hosted the Gluten-Free Round-up this afternoon with samples of gluten-free products throughout the store. I found a few new treasures at the sample tables: CocoAmour Lemon Poppyseed Macaroons, Ferndale Farms Cranberry Turkey Sticks and the Hail Merry Miracle Tarts! I have long been a fan of the Cherry Coconut Macaroons, and the Lemon Poppyseed flavor is an excellent addition to the repertoire. Those Cranberry Turkey sticks were tasty! A lot like Tanka Bites, without the paprika (nightshade) that gives me trouble. I left with a couple packages in my cart! Well, let me tell you: the Meyer Lemon tarts are the BEST Paleo treat I’ve had – EVER!! No kidding. And I am not usually a fan of lemon or tart desserts. I was blown away. So it’s both a good and bad thing that my local co-op now carries them; in coconut-vanilla, chocolate, chocolate-mint, chocolate-raw almond butter and these meyer lemon ones. Easy access = lots of consumption. Oh boy. I’m in trouble. This entry was posted in Edibles, Events & Activities and tagged gluten-free, snacks, treats on April 20, 2013 by Pamela. Do you ever wish you could find a satisfying, indulgent, yet guilt-free (primal) chocolate product? Your wish is our command! The taste, consistency and texture of the inside of a chocolate truffle candy – in a jar. I featured this in my “12 (Paleo) Days of Christmas” post last week as [#4] jars of LoveBean. I chose the fourth day of Christmas because you get free shipping with the purchase of 4 or more jars of this heavenly goodness. Also an excellent item for stocking stuffers, gift baskets or hostess gifts all year-round. Everyone loves chocolate! Click the link on the right side of this page to get your very own jar(s) and support Pamela’s Paleo Life blog efforts. Thank You and Happy Holidays! This entry was posted in Edibles and tagged chocolate, dessert, Food, gluten-free, Holiday, PALEO on December 19, 2012 by Pamela. $5 off Red Apple Lipstick!! Do you have a good resource for identifying “hidden” gluten-containing ingredients in foods and personal products? It’s not just the wheat flour, but also wheat-derived colors, flavors, thickeners and binders that contaminate you. Makeup, especially lip products are one thing most people forget about. Tocopherol (vitamin E) is almost always wheat-derived and contains gluten, unless the label specifically states gluten-free. Quality GF foundations, blushes, etc are available from Bare Minerals (Bare Escentuals stores) BUT know that their lip products are not GF! I found this out the hard way. My absolute FAVORITE cosmetic brand is Red Apple Lipstick: lip balm, lipstick, lip glosses and eye shadow (all allergen-free!) of superior quality. Jay Harper of RAL just launched a referral program. I signed up – and you should too! Give $5, Get $5 and Spread The Word About Safe Makeup! Since I really love their stuff, I’d appreciate it if you would click on the following link to give me credit for the referral. You will receive $5 off your first purchase at RAL. Enjoy! This entry was posted in Beauty, Celiac and tagged beauty, gluten-free on December 12, 2012 by Pamela.